We had 50 plus people on the sign-in sheet at our July Phlocking! The Rum Punch Bandits put on a great show and really got the crowd going. We had seven people join the club that evening. Also, thanks to everyone who brought items to donated to Paramedics for Children. 1) Which Club members have children named Thomas and Mimi? 2) Which club member rides a BMW Motorcycle? 3) Which club member teaches Spanish at Fort Mill High School? 4) Which two club members served in the first Gulf War? If you know of someone who has a birthday in August, and is not on the list, please let Mary know. Place chopped tomatoes, minced garlic, EVOO, Basil, salt and Pepper in an airtight container and refrigerate overnight. One hour before serving, remove tomato mixture from refrigerator to bring to room temperature. Thinly slice French bread, sprinkle with olive oil and place in oven at 400 degrees about 5 minutes or until lightly brown. Spoon mixture on to toasted bread and enjoy. Great appetizer! Great food, drinks and friends…what more could you ask for? Thanks to Charlie for hosting us and to everyone who brought food and drinks to share. What a blast! If you would like to host a happy hour, just let Charlie know the date and time. 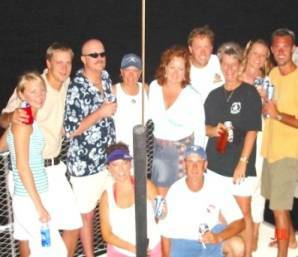 Meredith, Eric, Billy, Renee, Mary, DeWayne, Sheila, Jennifer, Roger, Rosie and Mark…Low Country Parrothead Club Sunset Cruise. July 26th…Eleven Sandlappers made the trek to Mount Pleasant to board a catamaran cruise sponsored by the LCPHC. We sailed out of Shem Creek and were treated to Shrimp, Crab dip, salsa and all the beer we could drink at a price of 20.00 per person! The sunset was beautiful and members of the Low Country Club were very hospitable. Thanks to Sheila for letting us know about the cruise and thanks to Eric for letting some of us stay at his place in Charleston! Their next cruise is set for October 1st. We’ll let you know details as we receive them. Great road trip! Happy Hour… August 5th at Jamie and Beth Medlin’s house in Fort Mill. 5:30 ‘til 8:00 or whenever everyone leaves. Jon Durham….Main Street Station in Belmont…August, 11th, 20th and 26th. Lake Wylie Jam…. August 21st… Long Cove Marina. Sponsored by the PHC of Charlotte and Paramedics For Children. Catch a shuttle at T-Bones or you can park at Long Cove Marina for a donation. RiverStock…August 27th… Roger Allen’s place at Lake Wateree… Camping party. Entertainment by Jon Durham. If you have a grill, please bring it. Sweet Hope Fall Jam … September 3rd Dark Corners, SC…featuring The Jon Durham Band and Rumors.